The façade of older brick buildings often show intricate repetitive patterns of indented layers dividing the façade into bays with decorative elements such as brick arches and Arduin capstones, ledges and cills. 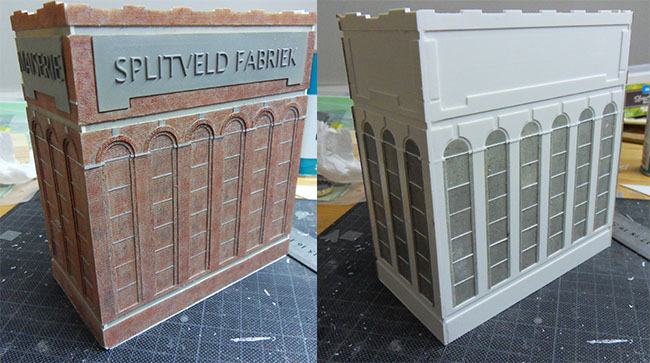 The base for such a building can be CNC milled with the complementary brick patterns used as inlay. This allows the entire façade to be built up like a jigsaw puzzle. A fine book on the industrial developments around the canal of Leuven showed some pictures of a huge maise processing company with attractive brick buildings. 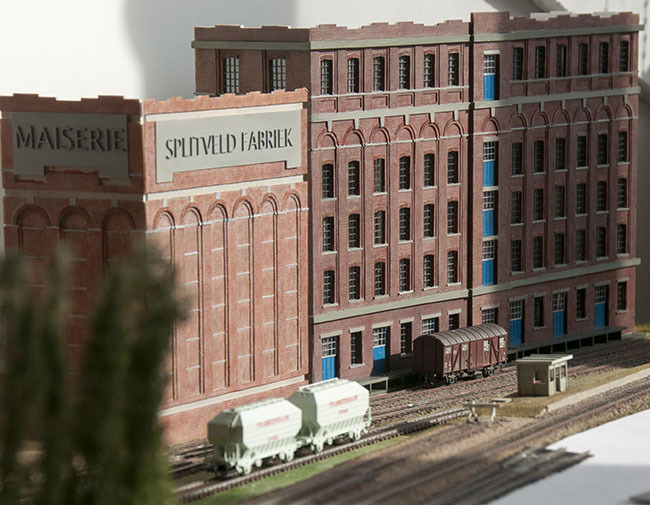 Having an area to fill with new buildings on Splitveld Fabriek the idea was born to produce such using the available tools. The building in question had sections at the top which showed the factory name, Usines de Stordeur, and the function, Maiserie, in concrete with projecting letters. 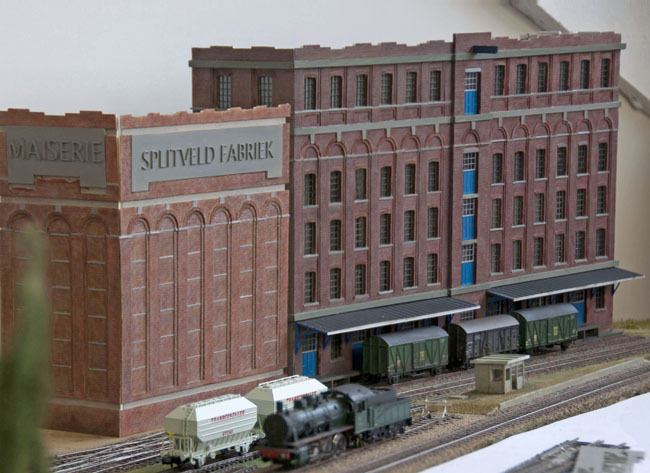 This formed an attractive element to reflect the layout name in the buildings. The building was designed in Corel draw using information from the book with maps giving the dimensions of the floorplans of the site. This left only the height of the buildings to be guessed from the various pictures with references such as wagons, ships and further elements in the picture. These dimensions were replicated in the drawing. The milling paths were generated in Corel by adding some leeway for the milling cutter and generating the paths using the contour function. The drawing and the resulting façade. The drawing shows the most straightforward façade, only some arches and straight hardstone ledges. The top shows the text which nicely stands out. 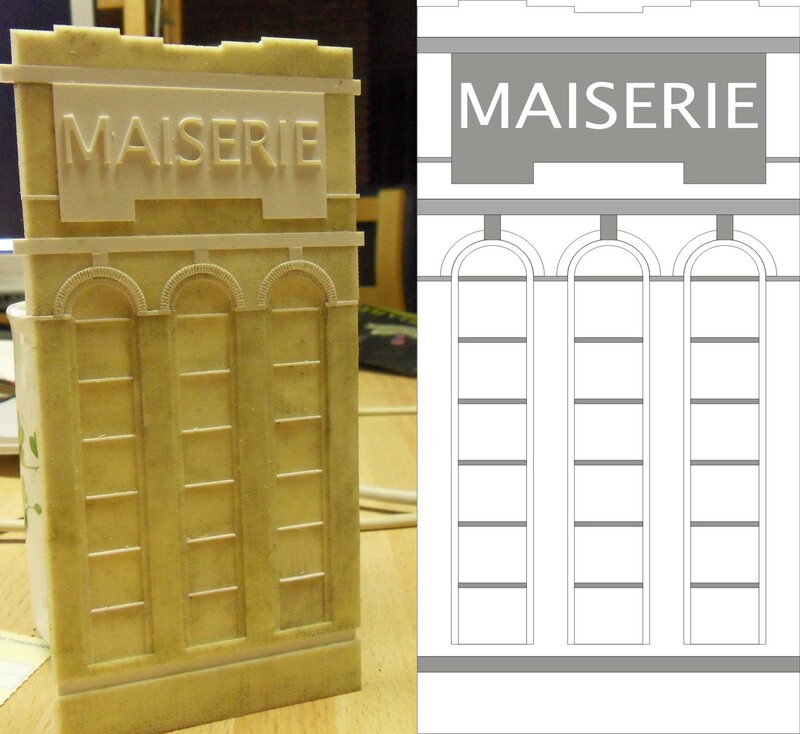 The method is based upon 2 mm thick polystyrene (PS) with milled contours and this is cladded with cut-outs from 0.6 mm brick sheet. The brick sheet is a home made casting in polyurethane (PU), in this case it still shows its natural yellowish colour. 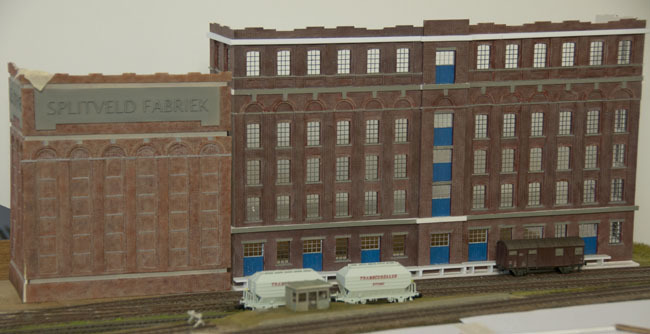 The process of making these is described here: bricksheet. 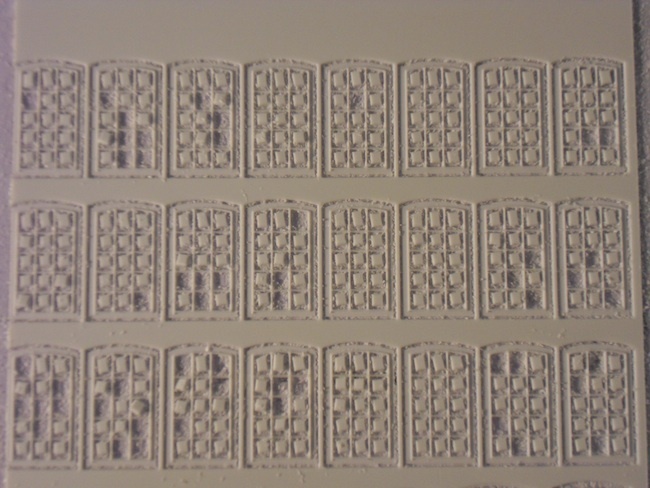 The arches were directly cut in 0.8 mm PS. The PU is simply glued using Faller glue for PS, which seems to work well although PU isn't attacked by it. The base sheet for the main façade as delivered by the machine. The main facade has lots of windows and some doors on ground level. The same facade cladded with grey brick sheet. The gray sheet is also PU but this time some fine ground carbon was added to obtain a grey colour to save painting the mortar colour. The white parts just show the base layer and still have to be cladded here. 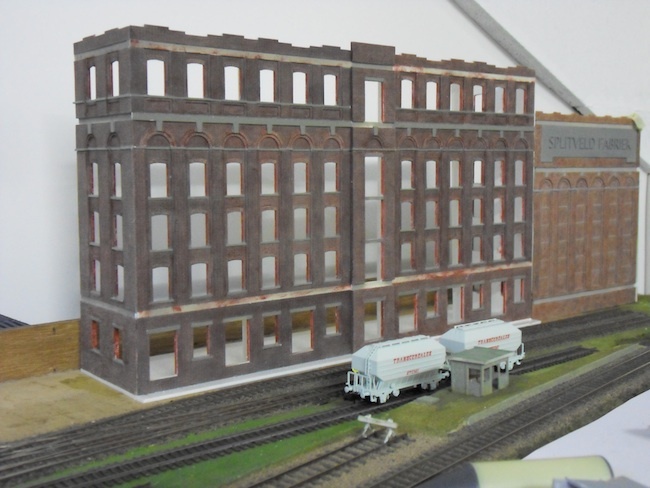 On the right we see the long wall of the silo, this is already coloured into red brick using acrylic paints. A first load of window frames, imagine having to cut some 60 of these by hand! 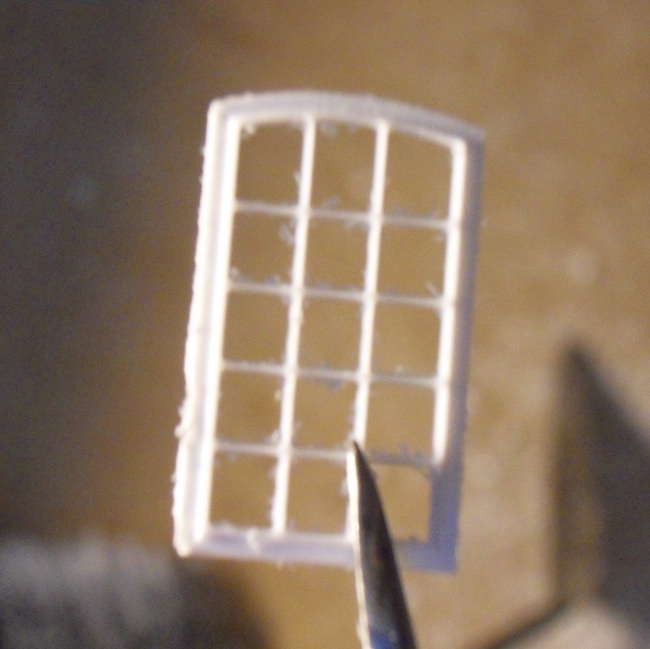 close-up of a window frame directly from the machine, except for a wipe-off of some loose statically clinging dust no further work is necessary. 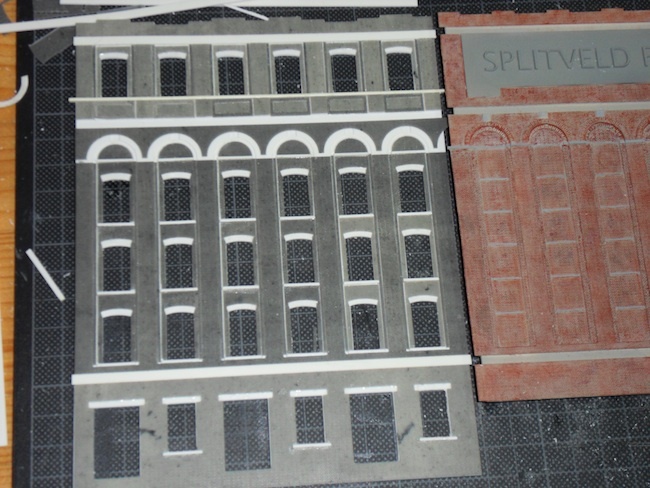 The main facade has lots of windows that are all cut from 0.5 mm PS sheet. The glass bars are only 0.15 mm thick. A view of the entire set of buildings erected, unfinished. 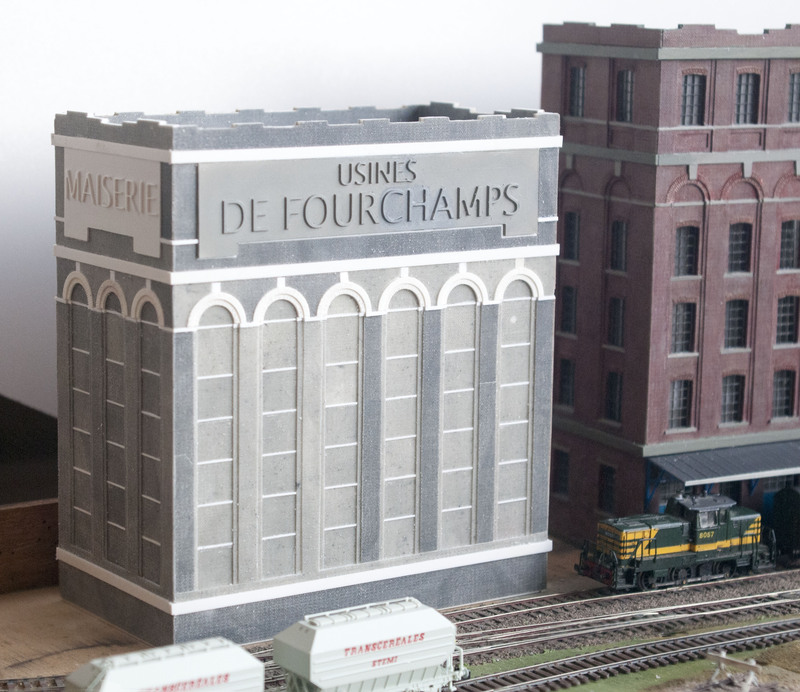 It is huge, the building dwells the grain wagons in front like it should. Still the original building had even a few more bays than I can accommodate here, besides that there were many more buildings behind it. The book shows a postcard boasting it being the largest maise processing company in Europe at that time (1910). The French (N160) grain wagons, just out of the box, clearly need a paint job to finish and a lot weathering of after that. Further jobs to do are to finish the ledges on the outside, mount windows, produce a loading platform with canopy and produce the doors. There was a hoist in the center to get heavy equipment into the building, roof and further interior reinforcements etc. And not to forget lots of pigeons sitting on the ledges. I have photos of buildings with similar functions taken from well over 100 m away and still you can count at least 25 of these beasts, clearly there seems enough wasted grain around to keep them fed. I lost precise count of all individual cut parts but it is well over 400 by now and not complete yet, it will certainly pass the 500.
glazed and some grey backing paper added. 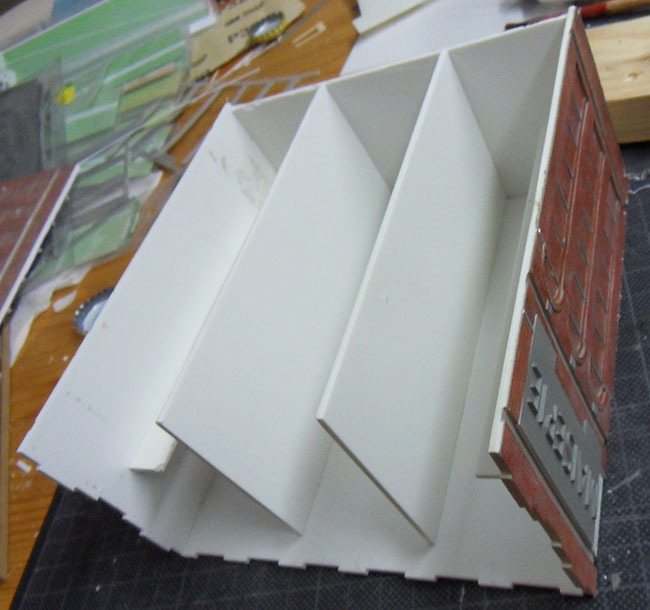 Further reinforcements were made and the roof was added although not finished yet. The canopy is in preparation but still needs some work. At large we are nearing the end of the main building here, the roof is roughly painted but needs further work with the inside cladding of the exterior wall and the top edge. The canopies are maybe a bit high but these were adjusted such that the (over scale) chimney of the diesel shunter will pass. Some minor work is still left such as a stairs at end of the platform, some masking of gaps, some weathering and the pigeons. 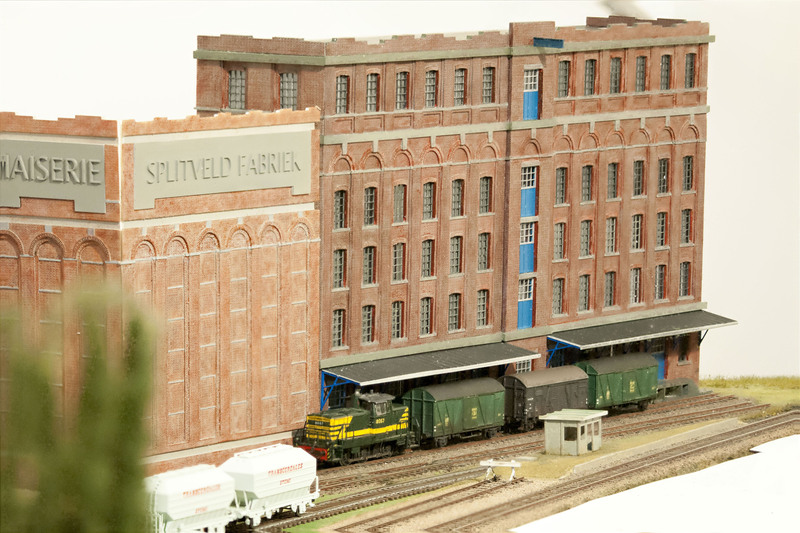 Of course the silo building that started this off still needs to be finished plus some unloading facilities are necessary requiring some additional track changes. Believe it or not but doing a recalculation of all the construction details delivers a count of 771 individual pieces of plastic, no wonder it takes several months building time! Just visible at the at far top edge the inner wall parts added and stairs at the end of the platform. The last 11 pieces were added (that is at least what I now think). The stairs were cut from a single piece of pvc by some hand milling using 1.5 mm steps in depth and height, maybe slightly high but that is a full turn of the handwheel thus easiest to produce. This makes it into 782 pieces for the building in total. This stage conforms quite nicely to my ideas. Now only the pigeons are left and probably some further detail will pop up in due time. I will try making some better pictures when the surrounds get more into final state because this one isn't 100% sharp. 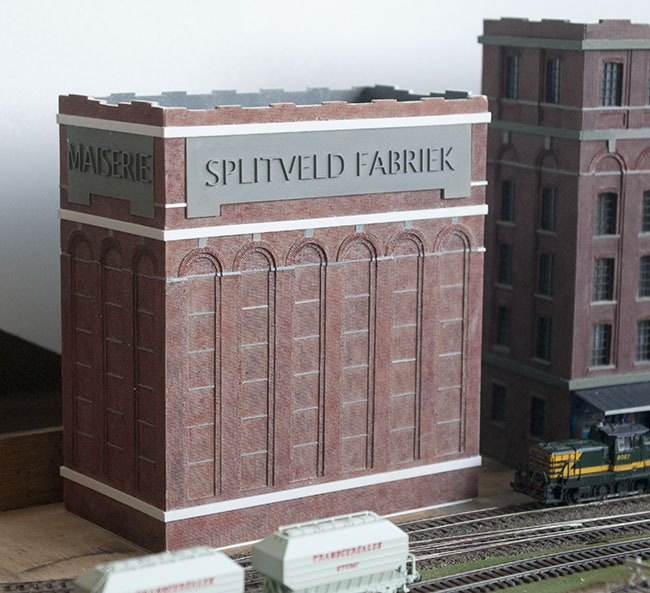 Currently the 2 failing walls of the silo are taken in production so that this building can be rotated showing the layout names in dutch and french as feature. You never know when that comes handy. Above picture shows the box construction for the silo. 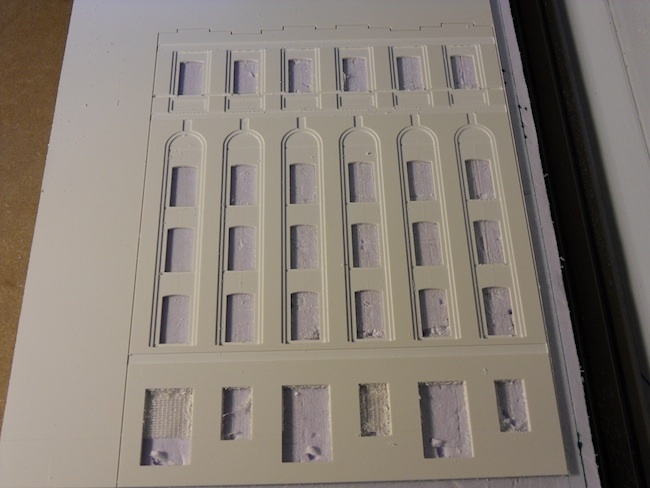 This may look a bit over done using so many inner walls all of 2 mm PS, but this size of material has sufficient bearing surface for gluing as stub bond and a model building can never be too rigid. State of the art showing the pilot sides and the new additional sides making up a full rectangular box. Obviously it is easier to produce the box first and than clad the walls on the corners with 45 degree edges in order to arrive at nice square corners. The bulk of the work has been done now, only a few bits to be added and it needs further painting of course. The french word Maiserie doesn't translate well into dutch (or english) making it much too long 'mais verwerkingsbedrijf' to put on the facade. It is not a malting such as used for beer production but it was mainly processing maize for oil, kitchen use and feedstock.